Analysis: Can Kelly Rein in the Unruly President? What Happens if Border Agents Are Allowed to Demand Access to Your Phone and Online Accounts? Donald Trump’s nominee to head the US Department of Homeland Security, John Kelly, is not as high on a border wall as his prospective boss. “A physical barrier in and on of itself will not do the job,” Kelly said during a senate hearing Nov. 10 as part of his confirmation. In his view, border security must also include close cooperation with countries as far south as Peru and curbing US demand for illegal drugs. These nuanced positions, offered during several hours of testimony before the homeland security and governmental affairs senate committee, contrast with Trump’s fiery campaign rhetoric. If confirmed, expect the retired general to continue speaking his mind: “Truth to power is the way to go,” he said during the hearing. Donald Trump has repeatedly hammered on the “problem” of illegal immigration from Mexico, despite the fact that it has been dropping significantly in past years. During the hearing, Kelly focused on Central American immigrants, whose numbers have been swelling. The way he spoke about people trying to enter the US illegally was also notably different from Trump, who referred to undocumented immigrants as “criminals,” “rapists” and “bad hombres.” “They, for the most part, don’t want to come up,” said Kelly, who spent time in Central America as head of the US military’s Southern Command. But they come anyway, because of the horrific level of violence in some of the region’s countries, the lack of economic opportunity, and the belief that if they reach US soil safely, they will be allowed to stay. 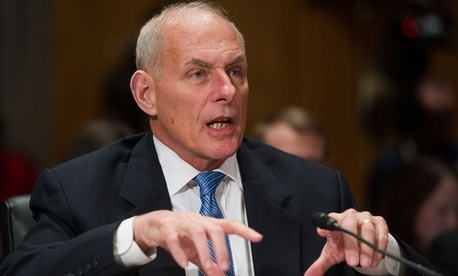 The job of Homeland Security chief is to follow the law, Kelly said—but he also promised senators he will “keep a very open mind” when it comes to the fate of beneficiaries of the Deferred Action for Childhood Arrivals, or DACA. The Obama administration program has allowed thousands of immigrants brought into the country illegally as children to live and, when reaching legal age of employment, work in the US. Kelly also said that law-abiding individuals would not be at the top of the list of people to deport—a policy in place during president Obama’s time in office as well. Kelly’s attitude towards Latin American countries was also more generous than Trump’s seems to be. Kelly talked about them in terms of partners and allies, instead of accusing them of shipping immigrants and drugs to the US, as Trump has repeatedly done. In fact, Kelly laid a large part of the blame of the international drug business, and the violence and public health problems it generates along trafficking routes, on the drug habit of US citizens. Even if the US blocks the entire southern border, he said, cartels would find a way to bring drugs in if people keep buying them. “It’s a tough, tough problem and it comes back to the incredible profits that flow out of our country because of the use of drugs,” he said. He argued that the US needs a comprehensive campaign to reduce drug demand at home, and to help countries south of the border to improve the lot of their citizens. “At the end of the day, it’s really improving the security on the ground and investment,” he said. Kelly also said he was against any terrorism-fighting efforts that target people on the sole basis of religion, including creating a Muslim registry. Instead, he said, his approach would be to develop ties with the communities, a strategy he credited leading to his success as a US military leader during the war in Iraq.